Submit Your Guest Post On A Site That Gets 300,000 Monthly Views! Hey guys, I wanted to tell you about a recent guest post that has been changing things for my website drastically. You already know that I am really big on writing 100% good original content. I’ve got some killer backlink strategies that you all have been exposed to. I’m a big user of WordPress plugins, and services like blogglue, and backlinks indexer. However, something I haven’t really hit on is writing a guest post. It is so very important that you branch of into your community whatever your niche may be. It is very similar to the blog commenting strategies we discussed on previous posts. So here’s how this goes down. Your site needs traffic, and it needs exposure. What if you could get your content on somebody elses site. What if I could post one of my articles on a site that had an Alexa rating of around 2,400 with 300,000 visitors a month. What would the results be? Well I did just that, and I’ll tell you about it a little bit later. First lets look into things a little bit deeper. What are the benefits of submitting a Guest Post? Massive! It is probably one of the best decisions you can make for your blog or website. Here is a list detailing some of the benefits. Masssive Traffic – This one goes without saying. You guest post should contain a link back to your site (will review this in more detail). When they click that link that’s just more traffic for your site! Authority – When they see your name, on a “Big Wigs” website, you’re going to gain respect and authority. This could be your Big Break! Relationships - This is a massive benefit. This could open up the lines of communication with other bloggers in your niche or market. Step #1 Identification – The first thing you need to do is identify the authority sites in your niche or market. Step #2 Build Relationship – Take the sites that you identified in the first step, and reach out to the owner or moderator. It always helps to let them know who you are before you ask a favor of them. Ultimately that is what we are going to do. The best way to build your relationship is to start leaving blog comments on their site. Now guys if you don’t know how to leave a blog comment the right way then make sure you read my post. I would leave a few comments and try to get the owner of the site to interact with you. You can do this by paying them compliments or asking them engaging questions. Remember every blog owner wants their commentors to provide value to their posts. Step #3 Research – What is their blog about? Who is it targeting? Is it targeting a male or female audience? What age group is it targeting? These are all questions you need to find the answers to. If your niche is controversial you need to make sure that your beliefs and opinions match that of the blog owners. Do they have a page that shows their most viewed or talked about posts? Pay attention to this. Which posts are getting the most comments? Does the blog owner hit on a certain topic quite often. To sum it up, figure out what this blog is about, and get to know the blog owner. Does the owner give credit to the guest post? Guys don’t screw this up! Go look at other guest posts. Has the blog owner provided a link back to the person that submitted the guest post? Is their any credit being given? You would be surprised, but there is a lot of website that will take the guest post, and give no credit to the author whatsoever. Just make sure you do your homework, and you’ll be alright. Step #4 Ask Permission – Now that you know about the blog and it’s owner. You’re going to have a good idea what you can write about. That’s not a bad thing. Worst case scenario if your guest post gets denied then you can submit it to another blog. If you have written a guest post with good original content, then it will get accepted at some point. With that being said, I typically contact the blog owner before I write the post. When you have done this enough times, they know who you are and it’s usually not an issue. Step #4 Writing the Post – Ok, so it’s time to write the guest post. This is another vital step. Your post has to be useful to the reader and has to provide value. 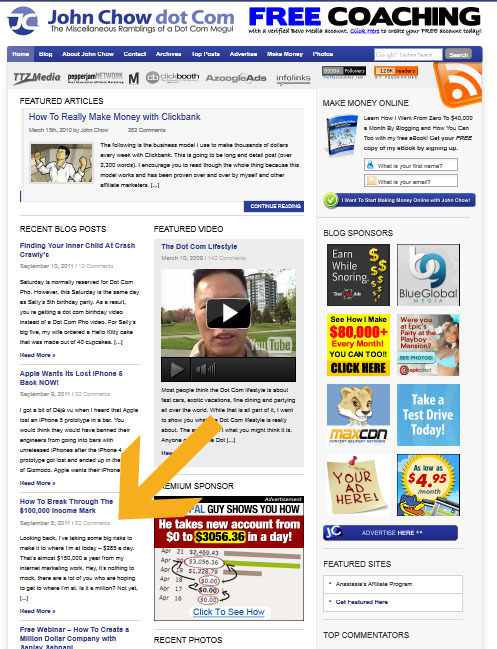 If you think you’re just going to start promoting one of your affiliate products guess again! The only benefits you should get out of this guest post is what I listed above and nothing more! Do not promote, just provide value! You get one shot at this. If you screw this up your probably not going to get a second chance. Especially if you have an unforgettable name like I do “NICELY”, not one that anybody is going forget any time soon. Most site owners have their guidelines posted. Here are mine. They are fairly standard. My name is Chad Nicely and my blog is chadnicely.com. My site focuses on Making Money Online, along with SEO, internet marketing, and traffic generation. After failing time and time again, I came across John Chow, and he inspired me. John’s “Ultimate Blog Profit Model” was a life changing event for me. I suddenly realized, the reason I failed all these years was because I had “Gold Fever”, and was an easy target for every new technique, program and strategy. I decided to take John’s advice. Instead of creating blogs for money, I decided to blog about something I was extremely passionate about, and have fun doing it. Much to my surprise he was right, and success just fell into my lap. It gets better every day. Right off the bat, I told them who I was, what my focus is and where they can find me. Next I give credit, where credit is due. The credit needs to go back to the owner of the site. Remember the people reading his site are a big fan of his anyways. Following this format, I have had every one of my author boxes approved. My name is Chad Nicely, and my blog is www.chadnicely.com. It is focused towards Making Money Online, SEO, and Traffic Generation. I would like to submit a guest post to you, that will provide your readers great value. I look forward to hearing from you. That’s it! Keep it short and simple. A lot of people will send me big long biographies, and dramatic stories. I hate to tell you this, but I just want to know the post is going to provide value to my readers, and will it help me site out. It is a given what it will do for the person submitting the guest post. Now, obviously you want the third option. Pay close attention! This is very important, when you get the chance to submit it. Don’t just paste the guest post in an email. Do not send a PDF, because the blog owner will have a hard time importing it into WordPress. Instead create a word document or a text file and attach it to the email. In the body of your email keep it short and simple. Most of the time us blog owners are reading this over our smart phones. An email like that would not really bother me. Just don’t forget to attach the file! When Will I know If My Guest Post is Approved? Guys, hear me out here. If the blog owner does not notify you when it is being posted. Don’t bug them. You know what your name is. You know what your title and url is. So lets just do a simple search and find out if your post has been submitted. DO NOT BUG THE SITE OWNER, UNLESS ITS NECESSARY! If they have submitted it, you will find it this way. If the owner doesn’t let me know, I run this search every day until it appears. Usually a guest post will be put in their que and submitted within a week. If two weeks have passed and you don’t find it. Then I recommend you contact the owner of the site. Be kind, polite, short and to the point! My Post is Submitted, I am Done! WRONG! Ferocious aren’t I? Well do you want to make this successful or not? 1. Make sure you watch for blog comments. They will come in pretty fast, depending on the quality of your content. Make sure you respond to each and every one of them. This is what the blog owner wants, and it helps the authority of the post. Guys, always be kind polite, say “thank you”, “I appreciate your comments”, “thanks for the kind words”, reply to every single comment. This is very important. A word of warning! You have now become somebody. They associate you with the site owner, you will receive negative comments, it will happen. They will challenge you, look for holes in your article, and question your credibility. Remember be polite, kind, and respectful. You can turn their negative into something positive and they will usually leave you alone. If you challenge them or fire back, get ready for a fight you’re not going to win! 3. Backlinks, Backlinks, Backlinks! Ok, I don’t want to get technical on you but I’m going to. The higher we can build up that sites authority and page rank, the better we will do. Say what Chad? You want me to build up a “Guru’s Site?” Yes, that is exactly what I want. Why? Remember your link is on this page. 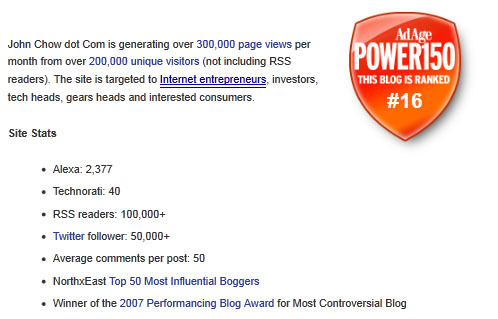 So the higher the page rank and authority for the guest post. The more powerful your back link becomes. The link juice flows! You’re going to want to do another guest post at some point, we want that page to be as successful as it can possibly be. Get as much traffic, page rank, authority, and user interaction as we can. If your guest post is a flop why would I accept another one from you? Let’s Make it as SUCCESSFUL AS CAN BE! My Recent Guest Post Success! I’ll bet you thought that title was a bunch of made up hype and fluff. Come on guys have I ever done that to you? Following my guidelines that I listed above I decided to go for the kill. I’ve posted several guest posts and done fairly well. However, it was time to just face my fears. I recently approached John Chow from www.johnchow.com. He is probably one of the biggest blogs in my niche. I did everything I just taught you guys. By the book! To my surprise, he asked me to send my post to him. I did that, he then said to me “I’ll take it.” That was it. I then made the mistake of sending my guest post off in PDF format. Now you guys see what I mentioned that above. He asked me for another copy in a different format. That was the end of our communication. For about two weeks I searched Google using the search string I gave you above. Finally one day it was there. Let me tell you something, that article this far has been a massive success. My traffic has gone through the roof, and I’m seeing an increase in sales. If you click the image or the link below. You will be taken to that page. Please while your there bookmark it, Like it, Google+, Tweet it, and most importantly leave a comment! Ok guys, there you go. Long post, but I think we covered every bit of it. Let me know what you think. Leave your comments below.